The Infrasonics Network is a prototype system to assess the possibility of improving warnings of severe weather events. Based upon a decade of study at ETL, IS Net was deployed in the summer of 2003 to evaluate it's capability to provide advance warning of tornadoes. How can infrasonic observatories improve tornado warnings? Provide vortex detection capabilities where radar constraints exist (e.g. obstacle blocking, longer ranges where radar resolution is degraded, short ranges where high elevation radar scans are limited). Provide detection continuity between radar scans (The interval between consecutive Nexrad volume scans is 5 minutes). Provide information on smaller diameter vortices. Provide information on vortices of limited vertical extent, which may not show clearly on volume scan displays. Potentially provide guidance for optimizing radar scans. Provide information on vortex core size (using the sound generation model of Abdullah, 1966). A 1995 observation of infrasound from an infrasonic observatory co-located with the CHILL Doppler radar in NE Colorado documented infrasound originating from the vicinity of rotation aloft, descending to the surface in the area of a tornado report. This observation led to a review of archived data, identifying over 100 cases where the directions and times of signals matched documented observations of tornadoes. 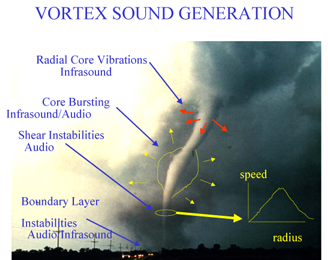 Subsequent field measurements through the summer of 2002 continued to indicate that infrasound could be useful for severe weather warning. Where is IS Net being tested? The array makes use of one existing infrasonic array at the Boulder Atmospheric Observatory, east of Boulder, Colorado. Two additional sites were installed near NWS radar sites in Goodland, Kansas and Pueblo, Colorado. 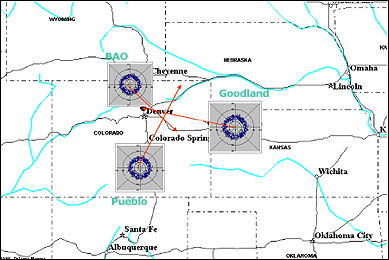 A map of the prototype network with the simulation indicated by red arrows of a triangulation on an infrasonic source in east central Colorado. Figure of infrasonic data overlayed on WSR-88D radar image. 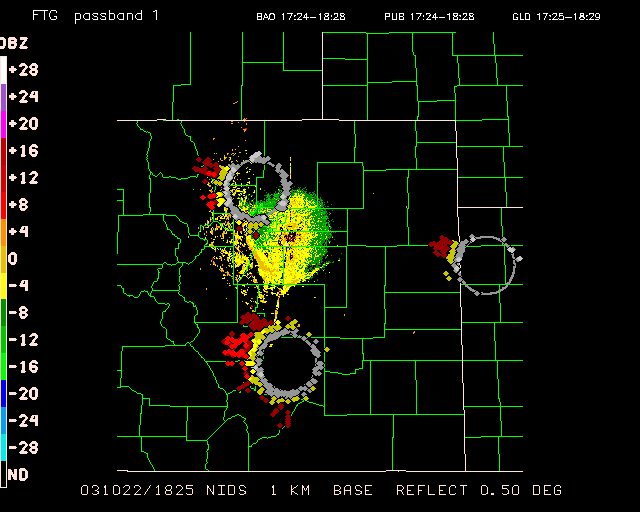 This is an example of a display showing actual infrasonic data overlaid on a WSR-88D National Weather Service Doppler radar image for Denver, Colorado. The lines are the county boundaries and the radii of the gray circles centered on the locations of the three infrasonic observatories indicate signal limiting noise level thresholds. Diamond markers indicate infrasonic data points. The directions of the data points extending outward from the gray circles indicate the directions from which sound is arriving. The distance outward from the gray circles indicates a measure of signal quality. Diamond data points colored gray, indicate data between 40 and 50 on a scale of 100. Diamonds colored yellow are data between 50 and 60. Diamonds colored red indicate data above 60 are excellent quality signals. This case in late October 2003 shows strong infrasound coming from the west-north-west, probably being generated by strong winds interacting with the mountains of central Colrorado. Such signals are not observed during the late spring and summer months. The smaller, more continuous data points (green to red) are the weather radar data. The color bar at the left shows the strength of the radar reflectivity in DBZ. In this case, the radar scan at 0.5 degrees elevation angle shows no probable source of the strong infrasound. However, in other cases the weather radar often detects strong echoes in the directions from which infrasound arrives. Bedard, Jr. A. J., B. W. Bartram, B. Entwistle1, J. Golden2, S. Hodanish3, R. M. Jones4, R. T. Nishiyama4, A. N. Keane, L. Mooney5, M. Nicholls6, E. J. Szoke2, E. Thaler5, D. C. Welsh. Overview of the ISNet Data Set and Conclusions and Recommendations from a March 2004 Workshop to Review ISNet Data.